Chris Dowson, his sons Adam and Cole enjoyed a great family fishing trip while on spring break in Naples. 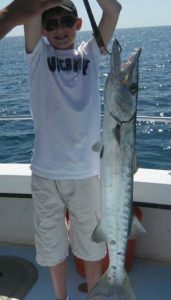 Fishing about 15 miles in the Gulf of Mexico for king mackerel the guys also had time to do a little sportfishing for barracuda and cobia. The king fishing has been very good but is just beginning to cool off as the waters continue to warm. As the waters around Naples are warming it brings in all the bait fish, which means the grouper are soon to follow. Spring fishing is great in Naples and all of southwest Florida. Don’t miss your chance to see for yourself how much fun it is!